Apple Pay is expected to be available in 60 percent of retail locations in the United States by the end of the year, Apple's VP of Apple Pay Jennifer Bailey told Fortune today in an interview at the company's Brainstorm Reinvent Conference. Since Apple Pay's 2014 introduction, Apple has worked to bring it to 24 countries around the world. Apple has to negotiate deals with each and every country where Apple Pay expands, so it's been a slow process, but growth is strong even outside of the United States. Apple has recently been focusing on expanding the usefulness of the Apple Wallet, which houses Apple Pay credit and debit cards. Apple Wallet is now being used for purposes like public transit, customer loyalty programs, student IDs (launching next week), and may soon expand to corporate access and hotel key cards. Apple's own campus permits employees to enter using Apple Wallet. "It's a tremendous new area for us to focus on, which is really access," Bailey said. According to Bailey, when Apple Pay was first introduced, Apple didn't approach the launch with the aim of disrupting the credit card industry. Instead, the goal was to work with credit card companies and introduce "great customer experiences." Apple was uninterested in pursuing a bank charter, necessary for introducing Apple Pay as a credit card replacement option, because it didn't want to face regulation. "When we thought about Apple Pay, we thought, there are a lot of payments out there that our customers already love and trust," Jennifer Bailey, Apple VP of internet services and Apple Pay, said Tuesday morning during Fortune's Brainstorm Reinvent conference in Chicago. "We don't sit around and think about, 'what industry should we disrupt?' --we think about, 'what great customer experiences can we develop?'" When asked if Apple makes money from Apple Pay transactions, Bailey answered the question with a "perhaps," but said that other features in the Apple Wallet are about bringing more utility to customers and making sure people "love their iPhones." And Walmart is the last hold out....I’m sure the CurrentC payment system will launch any day now. If I get a cellular Apple watch I won't need a phone or a wallet when I go out. You said that Apple Pay is the reason you want a cellular watch, but cellular connectivity has nothing to do with Apple Pay. Cellular connectivity isn't required for Apple Pay. A non-cellular watch works just fine. All the cellular watch capability provides is a network connection for data or phone calls. I always ask if a retailer accepts Apple Pay, and I often get a blank stare. If a quick once over of their hardware looks promising, I’ll suggest we try it. And when it works the clerks just go wow. I happened twice last week. At a stationary store in Hood River, Oregon, and a train store in Portland. Can someone tell me if there’s special sauce in Apple Pay vs. NFC payments where Apple Pay works when it’s not branded? Nope. 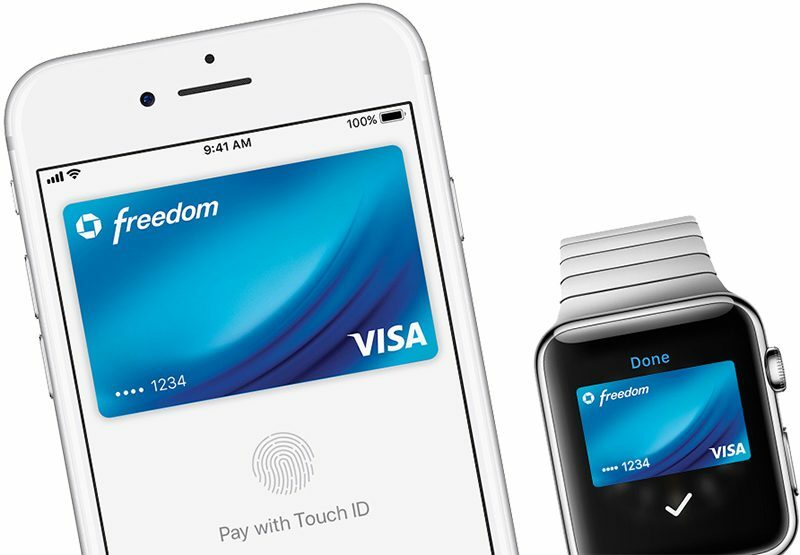 If a retailer accepts NFC payments, they accept Apple Pay. And Walmart is the last hold out....I’m sure thier CurrentC payment system will launch any day now. Incorrect. CurrentC is now Walmart Pay, and Target also remains a holdout. Kroger and gas stations, please! I remember when I first got the 6 and tried to use it everywhere. Sometime it worked but most times it didn’t. It’s really great now and I use it whenever possible. I don’t bother with the readers that liquor stores and small shops have though. They rarely work on the first try but the machines most supermarkets and retailers have work great. The small mom and pop Liquor stores work the best in my opinion. They always work when I tap. Super markets give me stupid “can not complete payment” or the NFC reader is dead entirely but it still shows the logo. I'm pretty sure when Apple Pay launched I heard that Apple gets 1% of all Apple Pay transactions but I could be wrong. No they get something like .05% and it’s paid by the bank not by the store. The store sees no difference and pays whatever the card rates normally are. I’d venture a guess that many of the holdout 40% are behemoth retailers — Kroger, Publix, Walmart, Target, etc. You’re right on the dot. I install card readers for a living. Most mom and pop stores accept Apple Pay. Costco, Circle K, Velero, 76, Chevron all have Apple Pay at the pump in arizona. Sad thing that my iPhone 5S with iOS 12 still doesn't support Apple Pay Cash. I know it doesn't have the NFC chip for store readers but I should be able to receive Cash payments or use Apple Pay for online purchases like the mcd app. There's no Plus-Sign in the Wallet app to add a credit card to my dismay. Now I'm looking for an used iPhone 6 just so I can set up Apple Pay Cash. Seriously? So it processes then connects to my phone and sends it through? You guys just all changed my life today! No. The card reader does all the processing. The watch just provides the card. No phone needed. I’ve found it’s better not to ask and just hold a phone over the card reader and they go through the motions. Even if it’s the small Verifone that faces the cashier. If you say Apple Pay they don’t know what you’re talking about. But holding the phone over it gives them the idea you’re paying them. My 86 yo mom has been doing this since day 1 of iPhone 6, and day one of Apple Watch. Was on the phone a day ago regarding kroger points card and asked if there was any word in activating Apple Pay (Kroger successfully trialled it in Arizona 2 years ago) but there was no new info. Told the representative to get word to management that we are shopping more at Meijer and Costco than kroger nowadays because Apple Pay. If it makes it any better, there was a job posting that said they’re hiring a specialist in mobile and Contactless payments. Do we really need it, I have my cards in my iPhone case, before even checking out I get the card out, when I have to pay I tap the card against the POS, that's it. Apple pay does not add anything in Europe amongst other places when you have your cards in a iPhone case. The only thing I can see is more convenient is when you don't have your cards/iPhone with you but do have a cellular Apple watch. Oh, and we don't have to think about security, ApplePay is just a bit more secure but to us as a consumer it makes no sense whatsoever, reason, if there's fraude we don't lose money as in the states (IIRC) so there's that. Would I like to see it here, yes, but I am OK without it. It's just convenience, nothing more, nothing less. In fact, it would help much more if we could use the NFC chip inside iPhones for other purposes, example, DigiD, there are several security levels available, yet I can't use level three, an NFC enabled phone is needed, or what about public transport, how convenient would it be to just tap your iPhone to check into the transport system. I use my iPhone for public transport in Phoenix and Portland all the time. Buses and trains have Contactless card readers that just read a regular credit card. It’s awesome! Waiting on New York and LA now! They said these are coming soon next year! No there are others such as Target, Krogers or Home Depot who still aren't accepting any contactless payments. Apple Pay is the reason I want a cellular Apple watch next time. Until then, my new 4 GPS will do fine! What do you mean? a GPS only Apple Watch can do Apple Pay just fine. It's not a feature that's exclusive to cellular models. CurrentC has been shelved indefinitely, and the Target App accepts Apple pay. But not the Target stores. Apple gets 0.15% in the US, supposedly much less elsewhere. Restaurants too. The ones that bother to upgrade to chip are generally not adopting pay at the table or even paying at the front for that matter. I would add hotels too. And by the way, the few restaurants that do accept Apple Pay in the US have implemented it the wrong way: by using an app. And I say it is the wrong way for two reasons: First, if every restaurant that wants to implement Apple Pay requires us to download an app we're going to end up with our devices full of apps taking up storage space and slowing down our devices, whereas pay at the table (or front) does not require any app. Second, by not implementing pay at the table or front, restaurants are still denying basic security to people who still pay with cards and have to let them be taken out of their sight. Not to mention that many restaurants still haven't upgraded from their magnetic stripe readers. It is an irony that I can pay with Apple Pay at most restaurants in Mexico, where Apple Pay hasn't even launched, and hardly any in the US. I was just travelling in Europe and found Apple Pay worked on a lot of terminals, even when it wasn’t marked. Contact-less payment infrastructure seemed pretty widespread from what I saw. Yeah once set up, Apple Pay works anywhere contactless payment is available. Even in countries where it hasn't officially launched. I use it in Mexico regularly, for example. Costco’s Gas Station was the first one that I ever saw accept Apple Pay. I saw an Exxon station in Laredo, TX last year (2017). Problem is that, in addition to nfc, the 5S lacks the Secure Enclave chip where the payment info gets stored. That's why it cannot use any of the Apple Pay features. If you can't get the used iPhone 6, look for a used original or series 1 Apple Watch. It may be cheaper than buying a phone. Gas pumps and restaurants. It needs to be at gas pumps. And restaurants. I've been skimmed THREE times this year, twice at gas pumps, once at a restaurant. I'm so sick of swipe only readers. I'm sick of criminal waitresses too now lol. I've seen Apple Pay pumps only at a new Love's. I go to Exxon when I can and use their Apple Pay enabled app, but that's still a PITA and carries it's own risks. Restaurants I've started paying cash only. Yeah it's an irony that, with Apple Pay not officially available in the country, still more restaurants and gas stations in Mexico are able to accept Apple Pay than in the US, where Apple Pay launched four years ago. How does it connect to the internet to perform a transaction then? I use it pretty much everywhere in Canada, except walmart cause they’re being stupid. It doesn't. Payment information is stored on the watch itself and all the watch does is transmit that info directly to the store's terminal and then it's the store terminal that will connect to the internet to request authorization for the payment. Interesting. I was always under the impression that internet was required to at least confirm you have the funds. It is required, but not on your watch. That confirmation is done by the store's terminal after you tapped your watch, not by your watch (or phone). All your watch does is send the payment information to the terminal. Costco fuel stations have the reader. It’s not working yet last I stopped by one.